You have seen me whine many times about Supermarkets and their free from ranges. I pick on Tesco as that is where I do my weekly grocery shop. I don’t particular like any one supermarket it simply boils down to convenience. In recent months I have started free from shopping at Holland & Barrett. 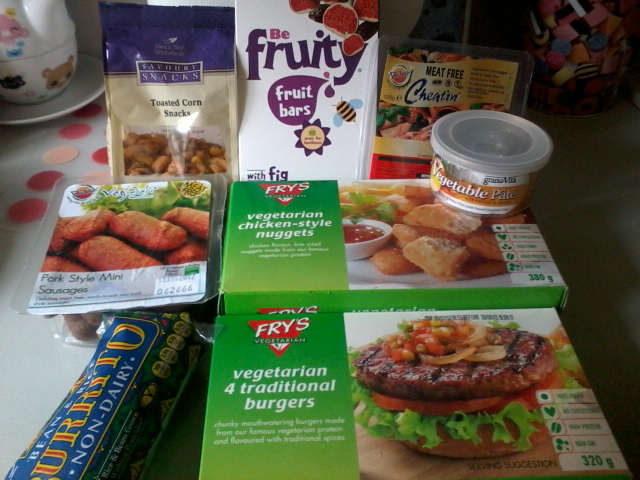 The selection for dairy and egg free (vegan) food outweighs what Tesco and Sainsbury's has to offer. FYI to save any confusion I am allergic to dairy and eggs and I choose not to eat meat so Vegan food is a nice easy safe option as far as I am concerned. This week my local Tesco, which is a considerable size, stocks Bessant & Drury dairy free ice cream and Food Heaven dairy free cheesecake. Wait a minute don’t get too excited you will only see one flavour in each product even though each range offers three flavours. Tesco you give in one hand and take from the other. You remember the chilled dairy free range I was happy to blog about finding? Oh boy those yoghurts and dessert are disgusting. Yes you read that right, disgusting, who on earth taste tests these products? Stick with Alpro I know I will never stray from that path again. Hold on a minute I cannot live on dessert for the rest of my life. What about main courses? Where are the dairy and egg free (vegan) foods Tesco? You keep tweeting me that you stock them but all I see is the gluten free aisle expanding. 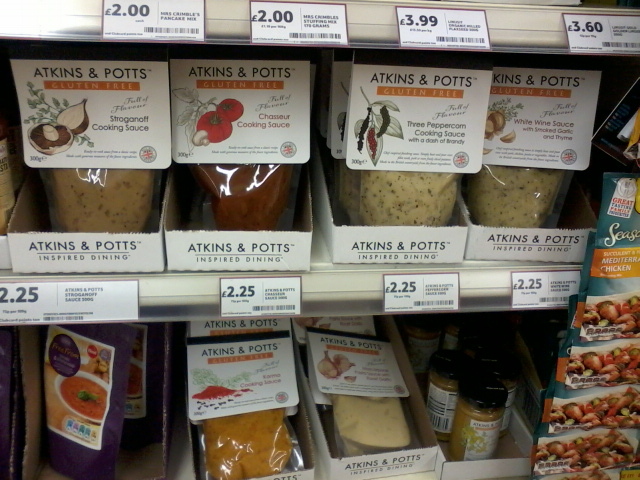 Classic example, this week I spotted a new range of sauces they are all gluten free but not dairy free. The newly launched chilled free from ready meals has one vegetarian option but its cheese pasta. As for the chilled vegetarian section, my store fills it with Quorn which contains milk and egg. Tesco own brand vegetarian sausages and burgers all contain milk and egg. I can find Cauldron Tofu but what about giving them some more shelf space? Cauldron’s range includes more than Tofu. The freezer section is equally annoying. Thankfully Linda McCartney sausages are vegan friendly along with Cauldron Aduki Bean Kievs (if I can get them as they sell out fast). When it comes to Tesco own brand the choice is vegetable fingers, whoopee thanks Tesco (I am being sarcastic just in case you were unsure). Imagine the joy when I see Amy’s Kitchen in the frozen aisle, that has been short lived excitement. Not a single vegan option from the range can be found. Oh and this goes for Sainsbury’s as well, you are guilty of this. I have a question for those with dairy allergies, what cereals are you buying? I stood in the breakfast cereal aisle last week in tears. I'm sick of Cheerios but couldn't find a replacement. Okay I am a little fussy I hate Weetabix, Shredded Wheat and the types loaded with sugar. Also what is with all the chocolate breakfast cereals? That is wrong on so many levels. I don't want to pay over £2 for the Free From varieties because I don't need to remove Gluten from my diet. I have heard fellow allergy sufferers discuss the Supermarket hop. Free From food is blooming expensive and at one time my weekend food shop took me from Tesco to Waitrose to Sainsbury’s to Holland & Barrett and finally a local independent health food store. This ended up costing me my sanity as well as my petrol. Now I know I am better off cooking from scratch but I am only human and there are times when I come home from work and want to bung something in the oven. I also require lunches for work during the week. Packed lunches when you have allergies are a freaking nightmare, something I still struggle to master. I have managed to perfect the art of Vegan baking, far tastier than the Supermarket free from offerings, come to think none of those are Vegan. I had to laugh Tesco offered to send me their Vegan stock list. Honestly what a joke this document was. Apparently vegetables and salad are vegan friendly. Really, am I stupid Tesco? If you are reading this Tesco my weekly shop at H&B is worth £20-£30. That’s on top of the £50 I spend in your store on other essentials. Are you interested to know how I spend my hard earned cash? then take note. Frys Vegetarian and Redwood Foods have a nice selection of vegan meat replacements. Tofutti have cheese slices and spreadable cheese much nicer than Tesco offerings. Of course I can buy my beloved Amy's Kitchen. Dairy free burritos and a Vegetable Korma perfect for lunch times and lazy evenings. Tesco only stock vanilla Swedish Glace but at H&B I can indulge in Raspberry & Blueberry. If I am peckish I can grab a vegan sandwich from Cranks. Imagine that Tesco, Vegans like sandwiches, wow who would have thought it. I suppose I should be grateful you brought back the dairy free buttons you took away from me. Thank god they came back I could no longer stomach another mouthful of that own brand free from imitation you market as chocolate. So there you go Tesco that pretty much sums up why I hate you. Unlike your other customers I can’t protest with my feet because my diet is limited. If I boycott you I would probably starve (Okay slight exaggeration but you get the idea). You have me where you want me cashing in on Clubcard Deals. I don’t care what you say Tesco you are rubbish at catering to multiple allergies. I am guessing you don’t give a s**t what I say as I keep spending my money with you anyway. P.S - I respect that a gluten free diet is difficult to manage, my Sister is a coeliac but recently I think the tables have turned. I now struggle to find replacement foods and feel she has more options. I am aware some of you may disagree. Brilliant post! I take it for granted that I can walk in to a supermarket and am able to buy/eat any of the products. It must be hard, especially with allergies, to go food shopping. Why should you have to have such a restricted diet just because of the lack of choice on supermarket shelves! If they can stock 60+ varieties of crisps I am sure they can stock a few more products suitable for vegans or those with specific allergies! Glad you enjoyed the rant & thank you for the support. Out of those 60+ crisps 99% of time ready salted are my only options thanks to Walkers adding milk to all the flavoured crisps (didn't use to be like that). I get jealous of my Boyfriend having free choice in the Supermarket. God, yes, I have the influx of gluten free stuff that's packed with dairy :( It's something I brought up with Starbucks for having wheat free break sandwiches with cheese in them. Really? Couldn't think of anything else to put in there? Our Tesco is quite good I think and they actually stock MIB's favourite gnocchi as it's only one we can find without egg. I find their labelling good, even if their choices aren't as ideal as we'd like. Trouble is, when it comes to allergies, etc. it's hard to please everyone and they prob have to go with majority - as long as they have research to back up the majority. Supposedly Starbucks has a Vegan Falafel Sandwich but I can never find it. I think labelling is good across all supermarkets not just Tesco. I know it's hard to please everyone but I thought Milk & Egg allergy were amongst the most common allergies to have? When I was a child Free From didn't exist so I am grateful for the food I can get but I am not thankful that I have to visit 8 shops to find it, order online or buy in bulk. I hear your frustration! Luckily my local Tesco has a wide range of veggie food, although I haven't looked to see what's actually vegan yet. My Sainsbury's though is poorly stocked, like you, I was thrilled at a choice of vegetable burger or vegetable fingers! I share your frustration! I think the reason that there is a lot of gluten free but not dairy free food out there is because the coeliac lobby is quite strong and has a recognised label. Also, lot of children with milk problems grow out of them within the first two years, so maybe this is why it doesn't get quite the same focus. Mind you, I thought that there were quite a number of coeliacs who also couldn't tolerate dairy - something I have tried pointing out to Starbucks re. their gluten free sandwich filling, but they have obviously decided my voice isn't strong enough to warrant a change of plan!! I have to say Tesco and Sainsbury's still get a lot of my Free From custom because their ranges are larger than some, but Ocado are becoming my favourites - they listen to recommendations from their customers. It may take time to filter through, but they do get there! Marks and Spencers, in my opinion have long way to go. The only specifically dairy free options in their stores, that I have seen are soya milk and dairy free spread - all the free from bakery stuff (bar the bread)is just gluten free. Very poor effort! Things can only get better - I live in hope! Don't take this the wrong way but I've been living in hope for over 20 years so you can imagine my frustrations, I am the child that didn't grow out of my allergies. I lived in Australia for a year and soya milk was everywhere when I came home it had only just hit the shelves that was 12 years ago. There did used to be a diary free chocolate cake in Starbuck but it long since disappeared and I don't know if you saw my other comment there is supposed to be 1 vegan sandwich. I have yet to sit down & look at Ocado but I never find the time. My sister is a coeliac but can have dairy but my Mum has IBS and can't have it. Marks & Spencer is catering for Gluten Free crowd, there are a few things I can eat across the store and buy on a regular basis. I am glad I wrote this post, it certainly is great to hear other people's opinions on the topic. Great post! I have been looking into gluten free products lately ( the boy thinks he is allergic) and as I shop in the same tesco I totally understand ! I was there on sunday and It is such a poor choice and the stuff that is dosent look great! I couldnt even find organic peppermint tea! ( they had green tea with pep but not by itself! ) while I was there I thought I would pick something up for lunch but none of the sandwiches were ' healthy' enough and ended up with sushi! I have definately been using H&B more! Have you checked out Waitrose or Sainsburys? May be better for Gluten Free. I find it impossible to grab lunch at Tesco. Our H&B is good but I have found out they discontinued my St Dalfour which is a shame. Well if you hate Tesco, you might be happy to read about how I took them for a few pounds last night. Legit of course.